BoLASEPaKO.com - a simple view on Singapore Soccer: [Event] US$30,000 awaits your team!! [Event] US$30,000 awaits your team!! This coming April will see some fast paced, dynamic street football action taking place at Ngee Ann City, as international acclaimed brewery Tiger Beer will be hosting the inagural "Tiger Street Football" regional tournament from 16 to 17 April 2011. The objective of this tournament is to elevate the level of play and passion for football on the streets of Singapore, as well as in other part of this region, namely Malaysia, Thailand, Vietnam and China. Instead of having matches being played on those conventional futsal courts, a unique oval, caged, hard-court pitch with no side-lines will be constructed on the venue to stage the 5-a-side knock-out competition that promotes a shorter, high-energy game of two 6-minute halves with a 2-minute halftime period that provides a refreshing platform for players aged between 18 to 34 years old. "Teams will have to register themselves at www.tigerstreetfootball.com.sg first before the public can vote on the website for their favourite teams to participate." "Tiger Street Football" regional tournament is organized in partnership with the Sports' Event Management arm of ESPN STAR, that would eventually see the one-of-its kind event broadcast live across Asia to more than 300 million viewers. “Tiger Street Football affirms Tiger's commitment towards creating unforgettable experiences for fans here in Singapore and around the world. "This will be an excellent opportunity for fans here to participate in and witness a new and exciting dimension to the sport." said Wong Mei Wai, Head of Marketing, Asia Pacific Breweries Singapore. "At the same time, fans will have the opportunity to immerse themselves in the atmosphere of the event and be a part of the fun-filled weekend.” added Wong. Concurring the thoughts, Harvey Davis, ESPN STAR Sports Vice President, Event Management said: “We're delighted to collaborate with Asia Pacific Breweries to stage this exciting tournament across the region and we're committed to offer our expertise to create an event that brings Tiger Beer's vibrant brand image alive on-ground and on our networks." The tournament in Singapore will feature 32 local teams battling it out on the first day for cash prizes of USD2,000 and USD600 awarded to the first and second placed teams respectively, along with a supply of Tiger Beer. 24 of the 32 teams will be pre-picked by ESPN STAR Sports, according to standings of local leagues and local tournament results. The remaining eight slots will be voted in by the public. Teams will have to register themselves at [www.tigerstreetfootball.com.sg] first before the public can vote on the website for their favourite teams to participate. The public voting mechanism has been created to generate interaction and involvement with the public who might be keen on participating. "Instead of having matches being played on those conventional futsal courts, a unique oval, caged, hard-court pitch with no side-line..."
The champions on Saturday will automatically qualify for the Grand Finals to be held in Kuala Lumpur, Malaysia in September. The top two local teams from Saturday's competition will get the opportunity to play against international teams, including players from England, Brazil, and Vietnam on Sunday for a chance to win additional cash prizes. To ensure fair play, the tournament will be officiated by referees from the Football Association of Singapore (FAS). Not just futsal though, as many fringe activities have been on the pipeline for everyone as well, which include Interactive Zones with games such as "Human Foosball" and "Darts Live" to allow all involved to have a great day of fun. Following the first day of competition on Saturday, 16 April 2011, the Tiger Football Stadium will come alive with a host of music and entertainment performances by renowned beatboxer Dharni and local act Jack & Rai, as well as Tiger Beer in a beer garden setting. Fans of Barclays Premier League (BPL) will catch a 'live' screening of the match between West Bromwich Albion and Chelsea at 11:00pm on a giant screen. "The objective of this tournament is to elevate the level of play and passion for football on the streets of Singapore, as well as in other part of this region." US$30,000 up for grab for the winning team! 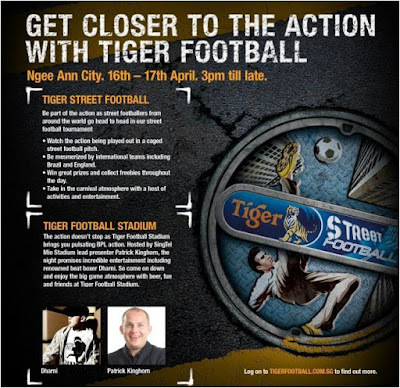 Tiger Street Football will kick off in Singapore on April 16 - 17 before moving regionally to Bangkok, Thailand (May); Guangzhou, China (July); Ho Chi Minh, Vietnam (August) with the culmination of an adrenaline-filled international grand finale in Kuala Lumpur, Malaysia (September). At the Grand Finals, the top team from each local leg will not only win attractive cash prizes but a chance to fight it out to be the Tiger Street Football Champion and win the coveted top prize of USD30,000.